Mickey is a stringer for the Associated Press and covers breaking news and feature stories on the western slope of Colorado. He covers an area which is encompasses the northwestern end of the state. From Rangley to Glenwood to Crested Butte to Telluride, his area is almost 1/4 of the state. He is available for assignments anywhere in the western state region for breaking news and feature magazine assignments. 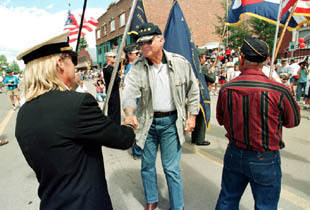 He worked as a stringer for the Denver Post from 1997-2000, The Grand Junction Daily Sentinel 1985-97. His news images have appeared in other publications including the Rocky Mountain News, NY & LA Times, Hollywood Reporter, Washinton Post, Life Magazine, Downbeat, Frets, Strings, Acoustic Guitar and Dirty Linen Magazine. 12-21-97 Delta, Utah. 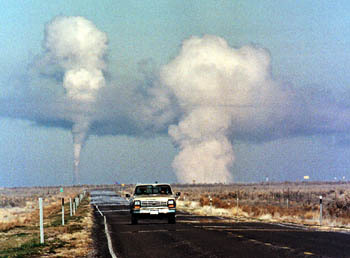 Motorists appear to be fleeing Armagedon on the road from Delta, Utah. 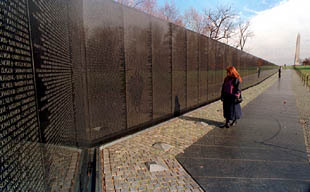 The steam plumes are being produced by a coal fired generating facility, Intermountain Power Service Corp.
Nov 30, 1996 A Washington, DC tourist visits the Vietnam memorial. The memorial sits in front of the Lincoln Memorial on the Capitol Mall.